Bulgaria's Deputy Defence Minister Anatoliy Velichkov Attended the Final Phase of the "Strike Back 2018"
THE KOREN FIELD TRAINING GROUND, Bulgaria, (BulgarianMilitary.com) – Last Friday (19 October), the final phase of the tactical training exercise Strike Back 2018 at the Field Training Ground “Koren” was held. The demonstrations, performed by the participants of the Bulgaria’s Land Forces, on the last day of the combat shooting drill, were attended and watched by high-ranking guests, including Deputy Minister of Defence Anatoliy Velichkov, learned BulgarianMilitary.com. After watching the performed tasks, Anatoliy Velichkov, said that he was impressed and pleased with the capabilities of all servicemen in the exercise, the professional conduct, as well as with the good interaction of the units of the reinforced mechanized battalion. Among the visitors, at the final day of Strike Back 2018, were also Deputy Chief of Defence Lieutenant General Dimitar Iliev, the Commander of the Joint Forces Command (JFC) Lieutenant General Lyubcho Todorov, Security and Defence Secretary of the President of the Republic of Bulgaria Stefan Yanev, Deputy Commander of the Land Forces Brigadier General Valeri Tsolov, and senior officers as well as representatives of the state and local authorities. Deputy Chief of Defence Lieutenant General Dimitar Iliev evaluated the built training capabilities during the tactical exercise, saying that the participants were well prepared and demonstrated high professionalism. Strike Back 2018, which purpose was the cooperation of the units, participating in defensive operations, to be enhanced, was conducted with the participation of servicemen, of the 42nd Mechanized Infantry Battalion, Yambol, with Commander Ivaylo Ivanov, assigned to 2nd Mechanized Brigade as well as the Land Forces and the Air Force units of the battalion. They performed tasks related to a defense area occupation and camouflage as well as deployment of engineering equipment on its territory. The tasks also involved defense actions, calling for the artillery and aviation fire, providing medical assistance including taking away injured from the battlefield, as well as medical evacuation using sanitary vehicles and preparation for subsequent evacuation. In total, this year’s tactical shooting drill was held with the participation of 700 servicemen of the 2nd Mechanized Brigade, a tank platoon of the Specialists Training Center, Sliven, a smoke platoon, assigned to the 38th Nuclear, Chemical, Biological Protection and Ecology Regiment, Musachevo, a platoon for signal reconnaissance and electronic warfare of the 1st Reconnaissance Battalion, Svoboda, cadets from “Vassil Levski” National Military University, Air Force servicemen, as well as 190 units of combat and special equipment. At the same time, Bulgaria’s Defence Minister, Krasimir Karakachanov, opened two-day International Competition Commando Challenge 2018 that was held at a tactical shooting range facility situated into the village of Michkovci, Gabrovo. It was organized by ex officers of Bulgarian SWAT team and ex officers of 68th Squadron – Special forces in cooperation with ICSTPS Alfa-Metal Ltd. 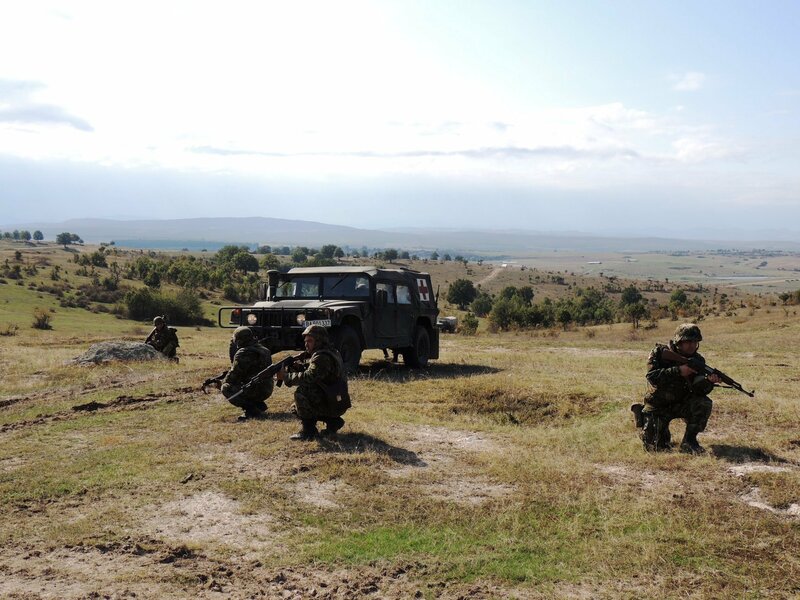 In it, 15 teams, including teams of the Bulgarian Army, the Bulgarian Special Counter-terrorist Unit, Ministry of Interior, National Service for Protection and a team from Ukraine took part. They performed tasks such as passing through an obstacle path, shooting with a long-barrel weapon on different distances, passing through a designated route, carrying an injured person, providing first aid, as well as an evacuation of an injured person.